I AM in Istanbul, fully rubbed and scrubbed, covered in soap and suds. My wet hair is plastered to my scalp and runny mascara has formed panda circles under my eyes. Here we go again — the young and vigorous Leyla is coming at me for about the fourth time with another gold-plated bowl brimming with water. “Plenty hot for you, lady!” she announces in a rejoicing voice. More sluicing and shrieking and general jiggling. Did I mention I am starkers? 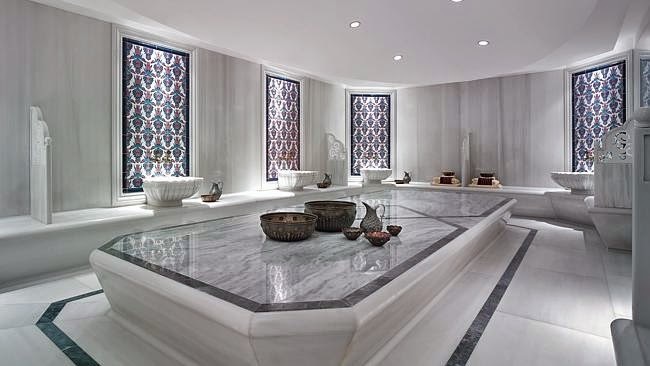 Welcome to a Turkish hamami (hamam), where modesty has no place. After being assigned a locker at the two-storey vestibule of Ayasofya hamam and donning a fine cotton purple pestamel sarong and blue plastic flip-flops, my hand is taken by Leyla and she leads me through to the main chamber, where she promptly whips off my covering. Leyla and her fellow attendants are draped in (soon to be thoroughly soaked) towels. The rituals of the bath-house are time-honoured and simple. It’s all about stripping off for the most comprehensive cleansing imaginable.